New Approaches for the Treatment of Fibrosis - Alexander Scriabine. Dr. S. J. Enna received his B.A. degree (1965, Biology) from Rockhurst University, Kansas City, Missouri and both his M.S. (1967, Pharmacology) and Ph.D. (1970, Pharmacology) degrees from the University of Missouri-Kansas City. Postdoctoral training in pharmacology was completed at the University of Texas Southwestern Medical School in Dallas, at F. Hoffmann La Roche in Basel, Switzerland, and the Department of Pharmacology and Experimental Therapeutics at Johns Hopkins University School of Medicine in Baltimore. Dr. Enna spent 10 years on the faculty at the University of Texas Medical School at Houston in the Departments of Pharmacology and Neurobiology. While at the University of Texas Dr. Enna was also a consultant for ICI USA, Inc., Merck, Sharp and Dohme Research Laboratories, Bristol Myers Corporation, and Panlabs, Inc. From 1986 1990, Dr. Enna was Senior Vice President and Scientific Director of Nova Pharmaceutical Corporation in Baltimore, and Executive Vice President from 1990 1992. He is currently Associate Dean for Research and Graduate Education as well as Professor of Physiology and of Pharmacology at the University of Kansas Medical School. Dr. Enna served as chair of the Department of Pharmacology, Toxicology and Therapeutics at the University of Kansas Medical School from 1992 to 2003. Other previous academic appointments include Lecturer in the Department of Neuroscience at The Johns Hopkins University School of Medicine in Baltimore and Adjunct Professor of Pharmacology at Tulane University School of Medicine in New Orleans. 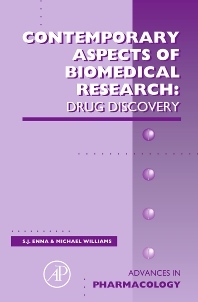 Dr. Enna served for six years as editor of The Journal of Pharmacology and Experimental Therapeutics, and is currently co-editor of Current Protocols in Pharmacology. He is also Editor-in-Chief of Biochemical Pharmacology, Executive Editor-in-Chief of Pharmacology and Therapeutics and Series Editor of Advances in Pharmacology. Besides his editorships, Dr. Enna serves on the editorial boards of Brain Research, Life Sciences and CNS Drug Reviews. He has been the recipient of Research Career Development Awards from the National Institute of Mental Health and the National Institute for Neurological, Communicative Disorders and Stoke. Other awards include the John Jacob Abel Award and the Torald Sollmann Award from the American Society for Pharmacology and Experimental Therapeutics, the Daniel H. Efron Award from the American College of Neuropsychopharmacology, and a PhARMA Foundation Excellence Award. In recent years he has been a member of the Scientific Advisory Council of Abbott Laboratories, has served on the Board of Directors of the Life Sciences Research Office, and on the Scientific Advisory Board of the National Alliance for Autism Research. He is currently a member of the Basic Pharmacology Advisory Committee of the PhARMA Foundation. Dr. Enna has held many elective offices in professional societies including the presidency of the American Society for Pharmacology and Experimental Therapeutics (ASPET). Since 2006 he has served as Secretary General of the International Union of Basic and Clinical Pharmacology (IUPHAR). Dr. Enna's research interests include neuropharmacology, neurochemistry and neuropsychiatric disorders. He has made significant contributions in defining the pharmacological and biochemical properties of neurotransmitter receptors, in particular those for GABA. He has also conducted research into the effects of hormones on neurotransmitter receptor function and receptor responses to psychotherapeutics, the development of receptor antagonists for NMDA, cholinergic muscarinic and bradykinin receptors, and the identification of the cellular components of coincident signaling in brain. Dr. Enna's research is described in over 200 published research reports, reviews, and book chapters. He has authored or edited over three dozen books on topics ranging from neuropharmacology in general, to neurotransmitter receptors and GABA.